A glorious mix of J. Jonah Jameson, C. Montgomery Burns, and Dr. Perry Cox, Sue Sylvester is played by Jane Lynch – by far the best comic actor on the show. She’s cartoonish, but she’s the best type of cartoonish. She’s a yellow complexion away from being a golden-age Simpsons character. Her lines – most of them elaborate, lengthy acidic diatribes – are nearly always quotable. She may be Glee’s best character, its most enduring comic invention. But as with so many shows, the most popular character (Urkel, Kenneth, Sheldon) is the thing that drags it down. Other plot lines, characters and stories get drowned out by the gimmickry of one increasingly one-note character. But on Glee, it’s a little more complicated. 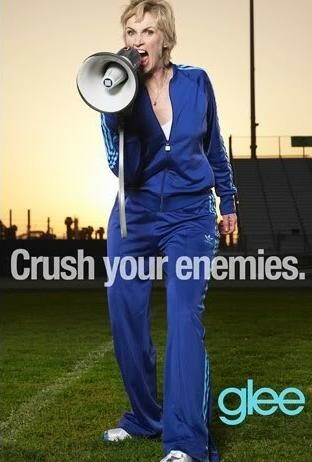 It’s not like Sue Sylvester is dominating their time. At the A.V. Club, Todd Vanderwerff points outthat the two best episodes of this season – “Duets” and “Silly Little Love” songs — were completely Sue Sylvester-free. He wasn’t the only one to notice this. First, as I’ve talked about in the past, problematic shows have many characters living in different comic universes: On The Office, for example, Jim lives in a low-key romantic comedy, Michael in a cringe-worthy comedy-of-discomfort, Dwight on a look-at-the-nerd comedy, and Andy on a more conventional we-love-our-characters sitcom. It’s hard for comic voices to harmonize when they’re all singing in different keys. Sue Sylvester would work well on The Simpsons, yes. But the rest of the show is not The Simpsons. It’s an inspirational sports-movie and a hyper-earnest musical, and an after school special and a teen melodrama. Some critics argue that the crazy inconsistency of Glee is precisely what makes it so popular. But the fact remains that Sue Sylvester the Insult Machine clashes painfully with every serious note the show tries to sing (including those involving Sue Sylvester the Sister of a Woman with Down Syndrome). The show expects us to feel empathy for Kurt struggling to come out to his father, and to laugh at Sue Sylvester writing that “I’m committing Sue-icide,” then trying to hang herself with an extension cord. Second, when Sue Sylvester is used to drive a plot, she sinks it. The Simpsons established an emotional core with TheSimpsons family dynamic that was consistent despite the zaniness around it. But Sue is so thoroughly zany that any attempts at “emotional” notes from her ring incredibly false. Her schemes – let’s shoot Brittany out of a cannon! – are too wild to be anything other than punchlines. She’s tried too many times to destroy the glee club, and failed anti-climactically too many times to establish any stakes at all. When “If we’re not successful, Sue Sylvester will destroy the glee club” is a drama-less premise, any episode featuring Sue is inherently inert. This Tuesday, Sue got all teary-eyed when she met cancer kids – clashing incredibly awkwardly with the same Sue that, just a half-hour early, asked, "Would you mind if I borrowed one of my rafters to hang myself? I did a test run in my office, and there's asbestos up there, and that can kill a person." But when Sue Sylvester is on screen, things are so weird, the “real stuff” seems all the more artificial. She's a great character — just not for this show.